Something they haven’t done in quite a while is get on the scoreboard first. Nashville seems to be chasing the game of late and that puts added pressure on the team overall. The Red Wings scored first when Luke Glendening deflected a shot on goal from Nick Jensen into the net past Pekka Rinne and the Wings took the early 1-0 lead. At 7:13 of the second period, Detroit went up by two goals when Dylan Larkin scored on the Red Wing power play and the visitors took the 2-0 lead. Viktor Arvidsson scored his 17th goal since December 31st at 7:49 of the second period, taking a pass from Ryan Johansen and firing a shot off the post past Jimmy Howard and the Preds were within a goal 2-1. Then P.K Subban fired a laser at 17:32 of the second frame and suddenly Nashville had a rare power play goal to draw even with the Red Wings, 2-2. The teams went to intermission all square, with 20 minutes left to decide the contest. 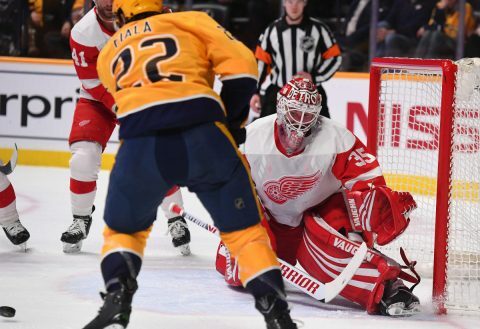 The deciding goal came at 4:03 of the third period when Andreas Athanasiou slipped a backhanded shot past Rinne for the 3-2 lead, that would be the final score. Nashville only put five shots on goal from there and that wouldn’t be enough to stop the bleeding, and Detroit would leave with the win. Laviolette is still trying to find some magic in a bottle by shuffling his lineup looking for better lines to compete, and Rocco Grimaldi rejoined the lineup, while Cody McLeod and Frederick Gaudreau were scratched for the night. 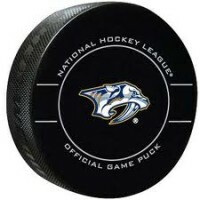 Nashville will host the Montreal Canadiens on Thursday night with the puck drop at 7:00pm.